Because other lower-tier facilities present their pricing at bottom barrel rates and then upcharge EVERYTHING customers want to add to their hosting solution. When data centers provide true colocation – and not simply dedicated hosting rentals of their own servers – there are a lot of variables. Company A might need more bandwidth than Company B even though they require the same amount of rackspace. Company B’s servers may require more IPs and need a greater power supply than Company A, and so on. Arguably, the variable with the widest range of possibilities is bandwidth. 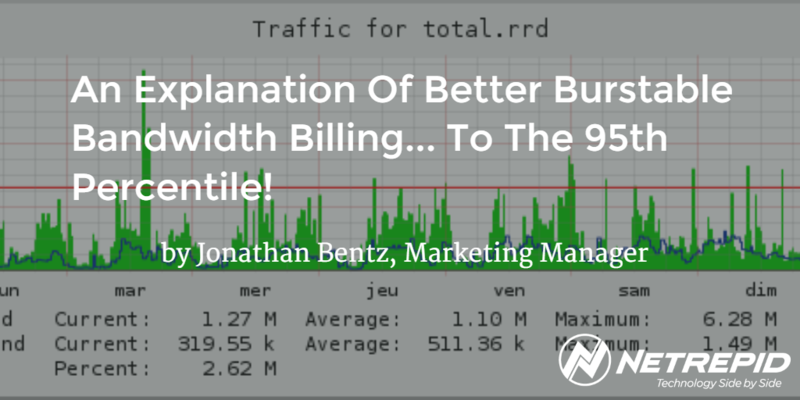 Because of that, Netrepid applies the calculation of burstable billing to its bandwidth pricing, based on the 95th percentile of actual usage. If you want to be brought up to speed on burstable bandwidth billing, an explanation, example, and sample calculation are included below. Your CFO Wants To $ave On Hosting? Show Them How. Download Our 95th Percentile Whitepaper! According to this most excellent Wiki entry on burstable billing, burstable billing is the process of measuring bandwidth based on “peak use”. Burstable billing practices also allow bandwidth usage to exceed a specified threshold for brief time periods without “financial penalty” from an Internet Service Provider. to pay each month for a pre-determined amount of internet bandwidth – and at certain times even EXCEED that bandwidth – without having to pay associated overage fees for the bandwidth spike beyond their contracted usage. Sounds great, right? Doesn’t part of you wish your cell phone provider would do the same thing? I kinda do! At Netrepid, we deploy the practice of 95th percentile billing to our burstable bandwidth pricing for all colocation tenets in our data center. A visual example of what you pay for - and what you don't pay for - when your hosting provider calculates 95th percentile billing of your burstable bandwidth. Want To See How Much Colocation Costs? Review Our Colocation Prices Before You Submit Your RFQ. Dedicated: a committed bandwidth volume that will be guaranteed to be available at all times to the server with no room for overage. Because it is committed exclusively to the server, dedicated bandwidth also has a committed price rate that is billed each month. Fixed Burstable: an open port (to a certain bandwidth cap) that DOES NOT guarantee availability of bandwidth, but monitors all peaks. Pricing would also adjust to permanently allow for availability of peak bandwidth. 95th Percentile Burstable: an open port that has higher priority than a fixed burstable port and is ONLY BILLED based on usage above the dedicated bandwidth volume. When you hit your dedicated bandwidth, 95th percentile burstable bandwidth will allow for the server to exceed its bandwidth allotment while also eliminating the top 5% of sampled usage from a billing period. Now, let’s review a sample log file of a 30-day measurement of internet bandwidth. At the end of that 30-day cycle, each of the samples are sorted from highest to lowest. When you apply the rules of 95th percentile burstable billing to this log file, the top 5% of logs are immediately removed from the file before determining a billable MBPS. The next highest measurement AFTER that top 5% then becomes the burstable billing usage on that server for the entire month. If the user only applied a dedicated bandwidth volume of 1MBPS, the bandwidth usage would have been maxed over 60% of the billing period. If the user only applied a fixed burstable bandwidth volume, the server would have required a minimum of 7MBPS to accommodate for the peak in its log file. If the user only applied a 95th percentile burstable, the top 5% of logs would have been eliminated, capping the bandwidth billing at only 2.62 MBPS. In this example, let’s also establish that the user had a dedicated connection of 1MBPS and 95th Percentile Burstable bandwidth for usage above that. Based on pricing alone, it may seem like fixed burstable is the way to go. After all, the savings per MB over dedicated (60%) and 95th percentile (67%) appear to be substantial. Let’s do the math though. And the user would have saved 28% on his monthly bandwidth charges. There are many benefits to choosing a third-party data center facility for your colocation, but there are a lot of financial considerations to make before selecting your provider. Bandwidth availability and pricing varies across the globe, and often times that happens because of the different ways colocation providers bill their bandwidth usage. Data centers that adopt a burstable billing methodology for calculating bandwidth costs present their customers with the ability to pay per MB for bandwidth they regularly use – while still having the ability to accelerate their usage when necessary. While the rates are often higher for 95th percentile burstable over fixed burstable, companies are more likely to find savings each month by embracing this ‘pay as you go’ opportunity over purchasing a larger volume of fixed bandwidth they will never use. Have more questions about burstable billing? Let us know in the comments below! Do You Have More Questions About 95th Percentile Burstable Bandwidth Billing? JOIN US ON FACEBOOK OR TWITTER TO SHARE YOUR STORY RIGHT NOW!